Jason Box returned to Greenland for a few days late in August, and was able to shoot the video above. 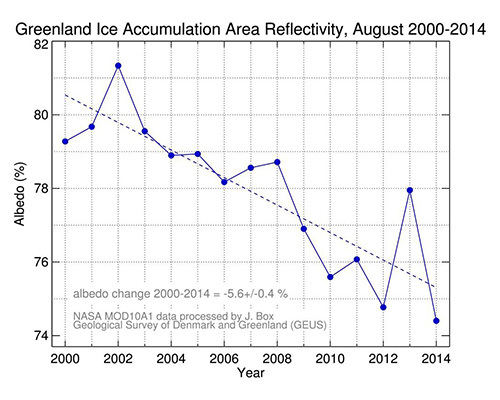 Newest observations show the lowest reflectivity on record for Greenland’s Upper elevations. Spongy sediments under Greenland’s ice sheet may accelerate its flow into the sea — an effect that previous estimates of ice loss failed to account for, according to University of Cambridge researchers. They said that means the ice sheet may be more sensitive than previously thought to overall climate change, along with short-term events like heavy rain and heat waves. The researchers said it was thought that Greenland’s extensive ice fields rested on hard bedrock, but new evidence shows that soft sediments also are present. Those sediments weaken as they soak up water from seasonal melt, allowing the sheet to move faster to the sea, the researchers said. Greenland’s ice sheet covers 660,000 square miles (1.7 million square kilometers) to a depth of nearly 2 miles (3 kilometers) at its thickest. A 2012 study found that the sheet’s melting was accelerating, and a 2013 study estimated that because of melting in Greenland and Antarctica, sea levels could be 2 feet higher when today’s preschoolers are grandparents. The research was funded by the Natural Environment Research Council and published Monday in the journal Nature Communications.